Two AFC Western Division rivals, the Denver Broncos and Kansas City Chiefs, had 3-1 records as they met in Denver on October 4, 1992. The Broncos had won nine consecutive home games against Kansas City and hoped to keep the string going. Denver was coached by Dan Reeves for the 12th year and had reached the AFC Championship game in ’91. As he had been for the past decade, QB John Elway (pictured above) was the key to the offense and he had a good group of receivers. The defense was strong at linebacker, led by the aging but effective ILB Karl Mecklenburg, and at safety with FS Steve Atwater and SS Dennis Smith. The Chiefs, under Head Coach Marty Schottenheimer, featured a conservative, ball-control offense operated by QB Dave Krieg and a solid defense with noteworthy performers in DE Neil Smith and OLB Derrick Thomas. There were 75,629 fans in attendance at Mile High Stadium on a sunny afternoon. The teams exchanged punts through a scoreless first quarter. 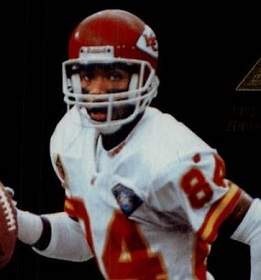 The Chiefs were deep in their own territory at the end of the period but put together a 94-yard drive in eight plays that concluded with Dave Krieg throwing to WR Willie Davis for a 50-yard touchdown. Nick Lowery added the extra point and the visitors held a 7-0 lead. The Broncos responded with a long scoring drive of 60 yards that took 12 plays. Starting from their 17, RB Gaston Green ran for 11 yards and John Elway threw to WR Mark Jackson (pictured below) for another 12. 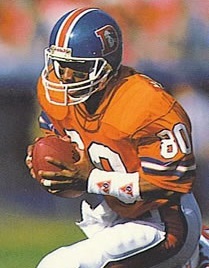 Three plays later, facing a third-and-five situation, Elway connected with TE Shannon Sharpe for eight yards to keep the series going and another pass to Sharpe gained an additional 14 yards to the Kansas City 33. After a loss, Elway lateraled to RB Reggie Rivers for a pickup of 17 yards. The drive finally stalled at the KC 23 and David Treadwell kicked a 41-yard field goal. The teams again traded punts. The Chiefs, regaining possession at their 22 with 1:25 left in the first half, moved methodically down the field and were significantly helped along by a 34-yard pass interference penalty. Lowery booted a 44-yard field goal on the final play before halftime to extend Kansas City’s lead to 10-3. The Chiefs had the first possession of the third quarter and advanced 62 yards in seven plays. Krieg passed to RB Barry Word for a gain of 23 yards and twice to WR J.J. Birden for 19 and 17 yards. Lowery again finished the drive off with a field goal, this time from 36 yards for a 13-3 tally. Denver went 75 yards in eight plays on its next possession, with Elway completing throws to WR Arthur Marshall for 21 yards and TE Reggie Johnson for 48 yards to the KC 11. The Broncos still couldn’t penetrate the end zone but came away with a 22-yard Treadwell field goal to narrow Kansas City’s lead to 13-6. The Chiefs again drove into Denver territory as Krieg completed four passes, the longest to Birden covering 19 yards. Facing third-and-ten at the Broncos’ 26, Krieg was sacked by Karl Mecklenburg, thus setting up a long field goal attempt of 49 yards by Lowery that sailed wide to the right. Getting the ball back with 1:15 remaining in the period, the Broncos immediately moved into scoring territory when Elway passed to Sharpe for a gain of 48 yards to the Kansas City 21. Elway was sacked on the next play by Neil Smith for a loss of nine yards but the Broncos were down to the 19 to start the fourth quarter. Treadwell attempted a 37-yard field goal that was unsuccessful, but the Chiefs were penalized for running into the kicker and it meant another try from five yards closer. This time the kick was blocked by DT Dan Saleaumua. Kansas City proceeded to put together a 13-play, 60-yard drive that not only led to more points but used up 8:23 off the clock. The Chiefs converted a fourth down and a third down along the way and Lowery kicked a 26-yard field goal to put them ahead by ten points at 16-6 with 6:16 left in regulation. It got worse for the Broncos on their first play from scrimmage following the kickoff when Elway fumbled while being sacked by Smith, and the defensive end recovered at the Denver 16. Lowery booted a 33-yard field goal, his fourth of the game, shortly thereafter and the visitors were now ahead by 19-6 with the clock down to five minutes remaining. Many of the home fans began to head for the exits. 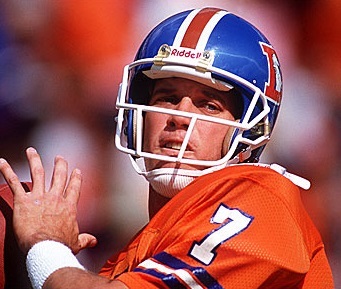 Elway filled the air with passes on the next series that started from the Denver 20. Eight of them were complete as the drive covered 80 yards in 14 plays, with three of them caught by Jackson. That included the last one that he grabbed in the corner of the end zone and covered 25 yards for a touchdown. Treadwell added the point after and the Broncos were now down by six points at 19-13 with the clock showing less than two minutes to play. With Denver using two timeouts, the Chiefs ran the ball three times from their five yard line following a short kickoff return and punted. Arthur Marshall came through with a big return of 28 yards to give the Broncos excellent field position at the KC 27. Elway threw to Marshall twice, for 11 and four yards, and then connected with WR Vance Johnson for a 12-yard TD. Treadwell added the all-important extra point and Denver had its first lead of the day with 38 seconds to go. The Chiefs had one last chance but, after reaching midfield, a fourth down pass that came up short effectively ended the game and the Broncos won in dramatic fashion by a final score of 20-19. The Chiefs had the edge in total yards (369 to 347) and time of possession (32:24 to 27:36), but were hurt by their inability to score more than one touchdown and thus settling for four field goals. Each team accumulated 20 first downs. Kansas City also accounted for five sacks, to three by the Broncos, and Denver suffered the game’s only turnover. John Elway completed 23 of 38 passes for 311 yards and two touchdowns while giving up no interceptions. Shannon Sharpe had 9 catches for 118 yards while Mark Jackson contributed five receptions for 59 yards and a TD. Reggie Rivers was Denver’s leading rusher with 34 yards on six carries and Gaston Green gained 23 yards on his nine attempts. For the Chiefs, Dave Krieg was successful on 22 of 31 throws for 301 yards and a TD while also not giving up any interceptions. Willie Davis (pictured below) caught 5 passes for 127 yards and the club’s only touchdown. Barry Word ran for 84 yards on 21 carries. “There’s more to that football team than John Elway, like that defense that kept us without a first down before their final possession,” said Kansas City’s Coach Schottenheimer of the Broncos. Denver lost badly the next week but then won three of four and had a 7-3 record before losing Elway for four games, all of which were losses. The Broncos finished at 8-8 and third in the AFC West. The Chiefs were ahead of them in second with a 10-6 tally, ending the regular season by pummeling Denver at home. Kansas City qualified for the playoffs as a Wild Card and lost to San Diego in the first round.